In a world where fitness trackers like the Jawbone UP3 and the FitBit Charge are making more than 700 million dollars in a single year, smartwatches like the LG G Watch R and Moto 360 should also have the ability to track health and fitness too, especially for the high cost. However, Android Wear users are at a bit of a loss when it comes to available health sensors. Most Android Wear-powered devices only have basic tracking devices like accelerometers and GPS trackers (though GPS inclusion is hit and miss), and the health trackers themselves have proven to be fairly unreliable. That shouldn't stop you from using your Moto 360 or your Sony Smartwatch 3 to improve your exercise schedule, especially if having a wearable will help motivate you. We've focused on the smartwatches with the latest Android 5.1. update, because the features have been tweaked to make the experience better. Fitness wasn't a primary focus of the update but the inclusion of an always-on face should help when you're exercising. The hands-free gestures also are handy for getting rid of notifications and resuming fitness activities without the need to swipe. In case you're wondering, the watches previously mentioned have been updated, along with the Asus ZenWatch, LG Watch Urbane, Samsung Gear Live and the LG G Watch. There are a number of tricks and tips you can use to improve your health tracking capabilities, as well as get the most out of your run, bike ride or general exercise. Google Fit was Google's original attempt at creating a health-focused app that could compete with the metric tracking functionality of Apple Health. While the app received lackluster reviews after its release more than a year ago, Google has slowly added a number of features to Google Fit over the last year or so. For example, Google Fit now has the ability to track more than 100 different health features as well as the ability to set daily goals and reminders. However, you should make sure that you sync up your Google Fit accounts on a constant basis so that you can maintain your data's presence in the cloud. You should also customize your Google Fit profile to make sure it's an accurate representation of your interests. For example, what are your exercise goals? What is your current physical state? You can enter data about your height, weight and gender through the Google Fit website or the Google Fit app settings. Users also have the ability to set their favorite activities, establish daily fitness goals and adjust tracking metrics via the Google Fit settings. If you're exercising outside a lot, then it's probably worth acquiring an app that can track your location. Not only will this help keep you safe, but it could help find the best routes to optimize your exercise time. If this feature interests you, you should consider apps like Runkeeper or Runtastic, which have the ability to sync up with the GPS chip in select Android Wear devices, such as the Sony Smartwatch 3. Not only does Runkeeper/Runtastic's interface provide some basic data metric tracking tools, they can help you follow preset paths, record routes for future records, and more! Not everyone wants to run or bike outside to stay in shape, so it's important to have apps that adjust to their exercise style. For example, there's the Nike+ Coach, a smartphone app that users can personalize to fit their exercise needs. For example, the Coach+ app can provide tips and tricks for weightlifters, basketball players, and even yoga enthusiasts. The Coach+ app also has the ability to create a tailored schedule that will adjust according to your needs. Here's an app idea for a developer to steal; they should create a way to let a smartwatch track the food and calories that a I'm consuming as I eat. What? That's not realistic? Then how am I supposed to track calories on my watch? The best option is to use apps like MyFitnessPal's Calorie Counter, which let users track the amount of food they consumed via smartwatch or fitness band as well as the calories that they burned that day. Most of these apps have installed a variety of tracking options for maintaining an accurate record of a user's consumption habits, including a barcode scanner and a food database with more than 5 million entries. 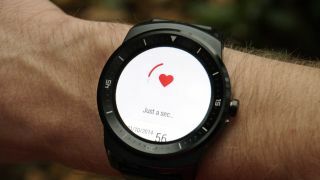 While most Android Wear heart rate monitors are fairly weak and have a significant margin of error, users can still try and use that data to optimize their workouts. Apps like Heart Rate OS expand the heart rate monitor's metric tracking capabilities. For example, an Android Wear device with Heart Rate OS has the ability track your highest/lowest heart rate on a daily basis as and record heart rate patterns. The app will then save that data to your Google Fit account for future tracking.